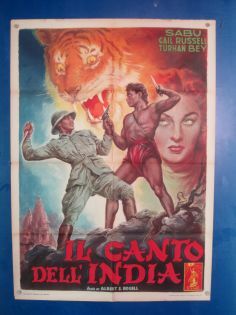 Directly from Italy the on-line gallery where you can find original vintage Italian movie posters and other Italian style collectibles. The site is intended to be a landmark for people who are passionately fond of the kind. It offers a wide view on the production of vintage Italian movie posters. What you will find inside the site, is just a small part of my own collection which gathers more that 8.000 different pieces, covering a period of time which goes from the 40 ies to the 80ies. Moreover, further material is regularly added to the existent one, so to make the exposition more and more complete. All the material displayed is original and there are no reproductions of any kind present. Would you be interested in a particular article or should you have any peculiar request, please do not hesitate and feel free to contact us. We will answer as soon as possible. Collection of hundreds of vintage movie posters at low value. Click on image to share our passion for less than 100 Euro posters !